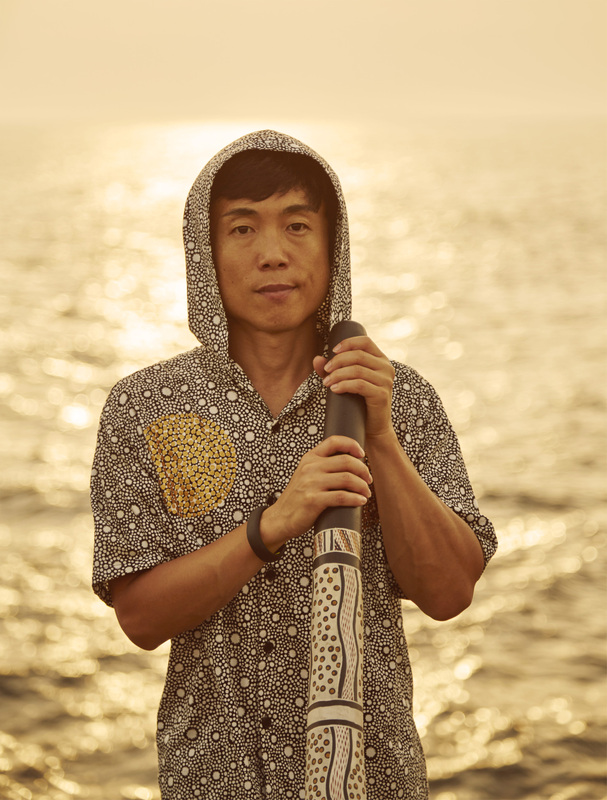 Hiroki Morimoto will be celebrating a musical milestone when he hits the stage at Fuji Rock Festival this year: 20 years with his instrument of choice, the didgeridoo. A serious car accident nine years ago, however, nearly brought his musical career to an end. Morimoto, an award-winning artist who goes by the name Goma, spent the next 24 hours in a coma. Partially paralyzed, he suffered from epilepsy and often had seizures. The accident also badly affected his long- and short-term memory. He had no recollection of his didgeridoo career and for several months the instrument felt alien to him. Morimoto was diagnosed with higher brain dysfunction due to the crash. During his recovery, he turned to art, despite having shown no prior interest in the discipline. A few days after being discharged from the hospital, he suddenly had the urge to get down on paper the multitude of vivid images he’d been seeing in his mind. Taking his daughter’s art set, he started painting striking dots. It was the first time he’d picked up a paintbrush since childhood, yet it all came naturally to him. The Osaka-born artist had no idea how he had acquired such a talent until visiting the Treffert Center in Fond du Lac, Wisconsin, last year. Alongside a film crew, he met with renowned psychologist Darold Treffert, who worked as an adviser on the 1988 film “Rain Man” and is one of the world’s leading figures in the epidemiology of autism spectrum disorders. He diagnosed Morimoto as having savant syndrome, an extremely rare condition (believed to affect around 1 in 1 million) in which persons with mental disabilities demonstrate extraordinary skills in memory-related areas such as rapid calculation, music and art. Painting is now a big part of Morimoto’s life and he has held numerous exhibitions showcasing his work. 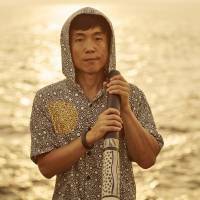 At the same time, he remains passionate about the didgeridoo and continues to perform regularly with his band Goma & The Jungle Rhythm Section. The group has toured all over Japan this year to mark its 20th anniversary and will be appearing on the Field of Heaven stage at Fuji Rock on July 27. Regularly surrounded by music as a child, Morimoto started out as a break dancer, but didn’t feel he was good enough to become a professional. He first encountered the didgeridoo in his early 20s when a friend brought the instrument back from a trip to England’s Glastonbury music festival. Intrigued by the sound and vibration, the dancer decided to get some bamboo and make one for himself. “It looked terrible,” he says, laughing. “Fortunately, it played OK. After a friend told me how to blow, I learned by myself, mastering circular breathing, which is the key technique for the didgeridoo. Keen to develop his own skills, Morimoto moved to Darwin, Australia, where he worked in a didgeridoo shop. An Aboriginal friend then took him to Arnhem Land, one of the country’s last true wilderness areas. He studied under the man known as the master and spiritual keeper of the didgeridoo, Djalu Gurruwiwi. Morimoto improved rapidly under his tutelage and in 1998 became the first non-Indigenous person to win the Northern Land Council prize at the Barunga didgeridoo competition. In the two decades that followed, Morimoto’s reputation and fan base have only continued to grow. Morimoto has remained positive despite the problems he has faced over the past nine years. He hopes his story can be a source of encouragement for people facing similar difficulties. He’s also pushing for a more effective social welfare system to support people with disabilities. Goma & The Jungle Rhythm Section play the Field of Heaven stage at Fuji Rock Festival on July 27 (3:20 p.m. start). Goma’s 20th Anniversary Tour hits Rag-g in Saga on July 19, Saihoji Temple in Yamaguchi on Aug. 2, Ongakushokudo Ondo in Hiroshima on Aug. 3 and Santaclara in Tottori on Aug. 5. For more information on venues and other dates in August, visit www.gomaweb.net.